“It is right, and a good and joyful thing, always and everywhere to give thanks to you, Father Almighty, Creator of heaven and earth.” As the celebrant, this is my response every Sunday to the Congregation’s profound and prophetic affirmation, “It is right to give God thanks and praise.” During the Eucharist, at the Lord’s Table, Christ invites us to be known and to be fed. The Eucharist nourishes and empowers us for the week ahead. On Sundays, we gather and worship in Church. Between Sundays, we are The Church! Throughout the country, there are countless churches in “survival mode”—they are barely able to sustain the opportunity to gather and worship together. Too often living the Gospel between Sundays happens on an individual level rather than through the mission and vision of the Church. Sadly, for most of these struggling churches, their fate is inevitable. There are three commonalities among Churches that decline and eventually die: (1) Lack of growth in Church membership, (2) Dwindling resources and financial support, and, (3) Inability to live out the Gospel between Sundays. Over the next decade, the stewardship of our finite resources (people, financial, leadership, and capital resources) is the greatest challenge for All Saints’, the Episcopal Diocese of Hawai‘i, and the National Episcopal Church. The reason why your Stewardship Ministry, Vestry, and rector emphasize “stewardship” is because it is through our offerings of time, talents, and resources that we are able to (1) Grow our ‘Ohana, (2) Provide resources and financial sustainability, and, (3) Nourish and empower the vision of All Saints’ between Sundays. The vision of All Saints’ is to be a cathedral for the people of Kaua‘i—a center for worship, education, outreach, and the arts. This is not a Sunday-only vision—it is a vision for 365 days each year. As All Saints’ nourishes and empowers us, we are called to nourish and empower All Saints’. We nourish and empower the Church when we share our time, lend our talents, and invest the resources that God has so richly bestowed upon us. Why is it important to not only celebrate and proclaim, but to also embody and live out stewardship? There is both a public and a personal spiritual journey when it comes to embodying and living out stewardship. In our public journey, as we go forward in 2017, I invite you to “lift up your hearts”, and with one voice joyously shout, “It is right to give God thanks and praise.” Between Sundays, take the Church into the world and give witness to your thanks and praise of God. In your personal journey, as you go forth with God and with All Saints’, I hope you have an opportunity to discern and pray how you can offer your time, talents, and resources for the glory of God. What would it look like if you invested further into the mission and vision of All Saints’? Any commitment of time, talents, and resources, especially when growing your commitment, demands a leap of faith. As we give more of ourselves, we naturally worry more about what remains. However, our life of faith calls us to embrace and exemplify a theology of abundant giving. It is through this theology of abundant giving that we reject the fearful mindset of scarcity; instead, we affirm our faithful commitment to give God thanks and praise from the living waters that flow endlessly from our Savior Jesus Christ. The river of God is rushing . . . and we rejoice, for the river is here! 2015/16 Campaign: "WE ARE MADE TO THRIVE"
Throughout the world, unfortunately, there are countless churches just trying to survive. Once routine tasks, such as raising necessary operational funds, balancing the budget, offering outreach ministries, and securing a long-term pastor, now are monumental chores filled with angst and despair. Sadly, survival has become the new normal in the church world. However, survival is not, and should not be, the only methodology for a church. Churches can and do thrive! All Saints’ is a community of faith that lives to thrive! What does it mean for All Saints’ to be thriving? Where is God calling us to live and love extraordinarily? We thrive in God’s love and the Good News of Jesus Christ. We thrive in caring for others. We thrive in being Christ’s Disciples in the world. To realize God’s extraordinary hope for us to thrive, our congregation must embrace a way of life that supports a bold vision, a climate of selflessness and sacrifice, broad and diverse leadership, and an uncompromising commitment to prayer, worship, and service. We invite our ‘ohana to join us on this journey to thrive! Please take some time to read through the accompanying literature highlighting a vision for All Saints’ to thrive! Also, enclosed is a pledge card that we hope you will return and offer on All Saints’ Day, Sunday, November 1st or shortly thereafter. Through the generous gifts of our time, talents, and treasure, we can proclaim with confidence that All Saints’ is just not surviving, but that All Saints’ is thriving! If you have questions or concerns, or would like to speak to me and/or the Wardens (David and Linda) and/or the Stewardship Chair (Bill), please do not hesitate to contact us. Preached on All Saints' Day 2015 on the day we ingathered our pledges for 2016. Father Ryan challenges us to ditch our survival suits. He tells us that we were made by God for so much more. We weren’t made to just survive . . . we are made to thrive! Kick-off sermon of the "We are made to Thrive!" year-long stewardship campaign. Father Ryan urges us to shift our mindset from “survival” to “thriving”. When we boldly step out, trust God, and follow Christ, we see the world and the Kingdom of God through new eyes. What a beautiful God we worship! God’s beauty is unmistakable and life changing. What are we? We are God’s beautiful children called to be an ‘Ohana who praises our ke Akua, who cares for our Creator’s ‘Aina, and who shares our Makana with all of humanity. The simple, yet profound theme of “Beautiful” guides our year-long stewardship campaign. Our theme is inspired by the words and music of Shawn McDonald's song, "Beautiful." The “Beautiful” campaign will spotlight quarterly themes, thereby inviting our community into a deeper experience and discernment of the divine beauty that surrounds and enriches us. We pray this journey strengthens each of our faiths and further opens our eyes to the beauty of God. 2013/14 Campaign: "sharing our joy"
The Sharing Our Joy campaign is a year-long stewardship campaign focused on broadening our community’s definition and understanding of stewardship. 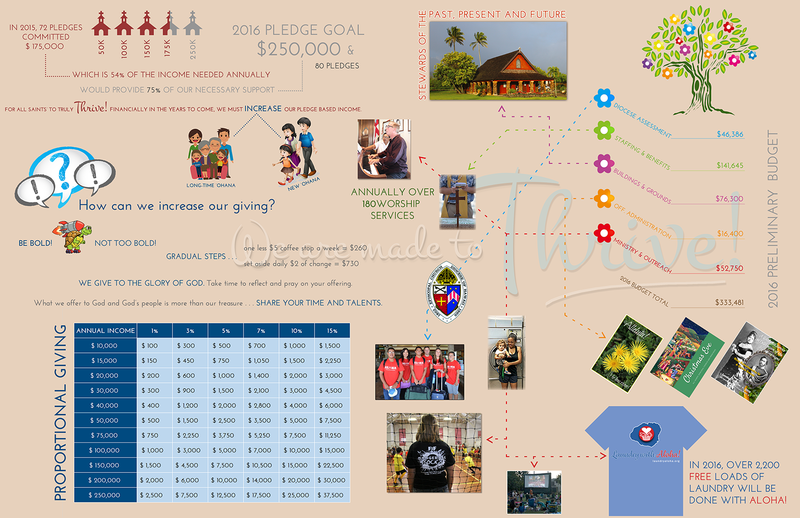 The fall aspect of the campaign centers on our Church’s financial sustainability through the generous support of our ‘Ohana. Following our ingathering of pledges, we look forward to engaging our Church community with other aspects of the 2014 stewardship program such as environmentalism, wellness, outreach, and spiritual gifts.